Downtown Fitchburg seen from the south. 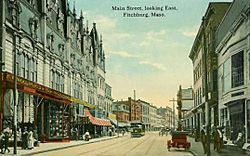 Fitchburg was first settled in 1730 as part of Lunenburg, and was officially set apart from that township and incorporated in 1764. It is named for John Fitch, one of the committee that procured the act of incorporation. In July 1748 Fitch and his family, living in this isolated spot, were abducted to Canada by Native Americans, but returned the next year. Fitchburg is situated on both the Nashua River and a railroad line. The original Fitchburg Railroad ran through the Hoosac Tunnel, linking Boston and Albany, New York. The tunnel was built using the Burleigh Rock Drill, designed and built in Fitchburg. Fitchburg was a 19th-century industrial center. Originally operated by water power, large mills produced machines, tools, clothing, paper, and firearms. The city is noted for its architecture, particularly in the Victorian style, built at the height of its mill town prosperity. A few examples of these 19th century buildings are the Fay Club, the old North Worcester County Courthouse and the Bullock house. 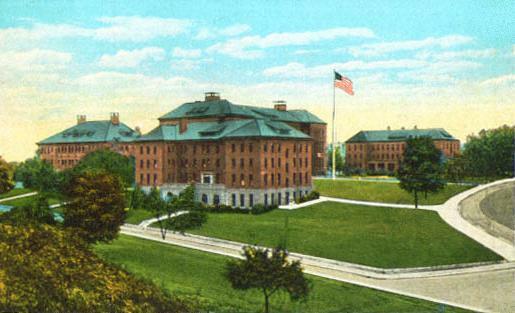 As the city is one of two shire towns, the Northern Worcester County Registry of Deeds, established in 1903, and the county jail on Water Street were two county facilities located in Fitchburg. The 1961 film Return to Peyton Place was filmed in Fitchburg. Fitchburg is located at (42.578689, -71.803383). According to the United States Census Bureau, the city has a total area of 28.1 square miles (73 km2), of which 27.8 square miles (72 km2) is land and 0.3 square miles (0.78 km2), or 1.07%, is water. The city is drained by the Nashua River. The highest point in Fitchburg is the summit of Brown Hill near the northwestern corner of the city, at 1,210 feet (370 m) above sea level. Fitchburg is bordered by Ashby to the north, Lunenburg to the east, Leominster to the south, Westminster to the west, and a small portion of Ashburnham to the northwest. Fitchburg's climate is humid continental, which is the predominant climate for Massachusetts and New England. Summers are typically warm, rainy, and humid, while winters are cold, windy, and snowy. Spring and fall are usually mild, but conditions are widely varied, depending on wind direction and jet stream positioning. The warmest month is July, with an average high temperature of 79 °F and an average low temperature of 56 °F. The coldest month is January, with an average high temperature of 31 °F and an average low temperature of 12 °F. North Central Massachusetts' most treasured cultural institution is a world-class family-friendly museum with a permanent collection spanning 5,000 years. The museum was founded in 1925 through the bequest of artist, collector and Fitchburg native Eleanor Norcross (1854–1923). Her extraordinary talents and educational vision highlights her as an important pioneer in American social history. The museum's four building complex features over 20,000 square feet of gallery and educational workshop space and includes the historic "Cross Barn" built in 1883, and the impressive Simond's building completed in 1989. Visitors can experience masterpieces in 12 beautifully designed galleries that feature American, European, African, Egyptian, Greek, Roman, Asian, and Pre-Columbian art. 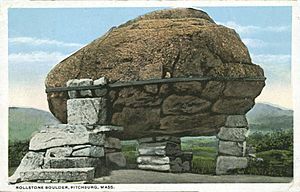 The Rollstone Boulder, on the summit of Rollstone Hill in 1909. This is the first—and only—toy museum in the world that’s completely devoted to aviation-related toys. Included in the museum’s collection of over 2000 toys are tin toys from Japan, Hungary, Germany, and the United States. Top Fun Aviation Museum. The Society houses more than 200,000 items related to the history of Fitchburg. Included in the archives are original Sentinel newspapers from 1838 to 1976, city directories, photographs, scrapbooks, manuscripts, family genealogies, postcards, files on industries in the City, and books and pamphlets on Fitchburg’s history from the 1700s to the present. In addition there is an extensive Civil War collection and a collection on the railroad. The Research Library is open to the public. The Society also has a remarkable collection of artifacts which tell the story of Fitchburg—early iron hearth cooking tools, the first printing press of the Fitchburg Sentinel, machines illustrating the strong industrial heritage of the City, a stellar collection of early paintings, and clothing representing many decades in Fitchburg. A comprehensive strategic plan completed in 2001 pointed out a need to find a building better suited our needs in order to continue collecting and preserving the history of Fitchburg and conducting programs for students and the general public. The Historical Society is now in the final stages of renovation and upgrading our building located at 781 Main Street. As a result of the renovations to the H. M. Francis Phoenix Building the Society has moved to its new location of 781 Main Street, Fitchburg, MA. 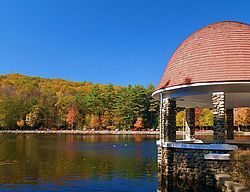 Coggshall Park is a Victorian park with miles of wooded trails branching out from around Mirror Lake, which is encircled by a walking path. Stone steps built into a hillside face a gazebo on the water, making this a popular spot for weddings and photos. A classic stone house on the property overlooks Mirror Lake. The tables and benches scattered around the park draw picnickers as well as those simply seeking a place to relax. For the children there's a playground that sits adjacent from the pond and a frisbee golf course. Coggshall Park was a gift to the City from Mr. Henry Coggshall, an executive of The Fitchburg Gas Company, and his wife in 1894. The initial donation included 86 acres (35 ha), but the couple subsequently purchased and donated additional parcels to create the 212-acre park that exists today. Coggshall Park also abuts a large parcel of conservation land and a bird sanctuary, providing a total of approximately 300 acres (120 ha) for visitors to enjoy. As of the census of 2010, there were 40,318 people, 15,165 households, and 9,362 families residing in the city. The population density was 1,450.3 people per square mile (560.8/km²). There were 17,117 housing units at an average density of 615.7 per square mile (239.3/km²). The racial makeup of the city was 78.2% White, 5.1% African American, 0.3% Native American, 3.6% Asian, 0.0% Pacific Islander, 9.1% from other races, and 3.7% from two or more races. Hispanic or Latino of any race were 21.6% of the population (14.6% Puerto Rican, 1.8% Dominican, 1.6% Uruguayan, 1.4% Mexican, 0.3% Colombian). 76.9% spoke English, 15.1% Spanish, 4.2% Other Indo-European Language and 2.6% Asian and Pacific Islander Languages as their first language. There were 15,165 households out of which 29.0% had children under the age of 18 living with them, 39.3% were married couples living together, 6.1% had a male householder with no wife present, 16.2% had a female householder with no husband present, and 38.3% were non-families. 29.8% of all households were made up of individuals. The average household size was 2.49 and the average family size was 3.10. In the city, the population was spread out with 22.9% under the age of 18, 14.1% from 18 to 24, 25.9% from 25 to 44, 24.7% from 45 to 64, and 12.4% who were 65 years of age or older. The median age was 34.7 years. For every 100 females there were 94.5 males. For every 100 females age 18 and over, there were 92.3 males. The median income for a household in the city was $47,019, and the median income for a family was $57,245. Males had a median income of $47,350 versus $37,921 for females. The per capita income for the city was $22,972. About 14.6% of families and 19.4% of the population were below the poverty line, including 27.3% of those under age 18 and 12.7% of those age 65 or over. 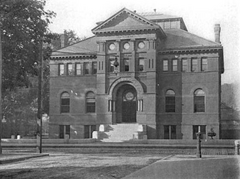 The Fitchburg Public Library was established in 1859 after citizens of Fitchburg approve an article on the warrant requesting $1851 and quarters in the Town Hall for the first Fitchburg Public Library. In 1885 Rodney Wallace builds and furnishes the Wallace Library and Art Gallery at the corner of Main Street and Newton Place as a gift to the people of Fitchburg. Then in 1899 library service for children begins in one of the first Children's rooms in the country. It wasn't unit 1950 that a new separate Fitchburg Youth Library was opened. Service of the library was increased with the purchase of a bookmobile which extended service to outlying areas of the city. Fitchburg Public Library becomes the first regional library in the Massachusetts Regional Library System in 1962. The existing Wallace Library is dedicated in 1967. Named for George R. Wallace, Jr. and his wife Alice G. Wallace, who gave a magnificent gift for the library building. The federal Library Services and Construction Act and money from the City of Fitchburg also funded the project. And Helen E. Vickery Fund provided for a new bookmobile. In fiscal year 2008, the city of Fitchburg spent 1.34% ($1,111,412) of its budget on its public library—some $27 per person. In fiscal year 2009, the city of Fitchburg spent .48% ($388,977) of its budget on its public library -- $9.23 per person. This represented a year over year drop in municipal funding of 65% between FY2008 and FY2009. As a result, the Fitchburg Public Library did not meet Massachusetts minimum standards of public library services and was not certified by the Massachusetts Board of Library Commissioners for FY2009. It returned to certification in FY2012. Furthermore, on going support comes from the Friends of the Fitchburg Public Library. The Friends of FPL establish closer relations between the library and the people it serves, promotes support of services, and funds several important services such purchasing books for the library and the fees for the museum passes. The Friends work with area museums to bring you Museum Passes you can use to visit exhibits for reduced fees. In 2014 the Fitchburg Law Library opened at the Fitchburg Public Library in response to the closure of the office on Elm Street in Fitchburg. The new library location is fully accessible and open to the public. Transportation for Fitchburg is largely supplied by the Montachusett Regional Transit Authority (MART). MART operates fixed-route bus services, shuttle services, as well as paratransit services within the Montachusett Region. It also provides connections to the MBTA Commuter Rail line at Fitchburg Station. The Fitchburg Station is the last stop on the Fitchburg Line from the North Station in Boston. MAX provides intercity bus service to Worcester and Brattleboro, Vermont with intermediate stops. The Fitchburg Municipal Airport occupies 335 acres (136 ha) off Airport Road in Fitchburg near the Leominster border. In 1940, the airport land was donated to the City of Fitchburg and serves the greater Fitchburg area. Throughout the early twentieth century, Fitchburg was known for its paper industry, which occupied the banks of the Nashua River and employed a large segment of the European immigrant population. It has been noted by many residents in Fitchburg that the Nashua River would be dyed the color the paper mills had been coloring the paper that day. Founded in 1939, the Wachusett Potato Chip Company purchased the former County Jail buildings and grounds in the 1940s and has operated as a manufacturing and distributing facility for snack products since that time. It was purchased by UTZ in 2011 and still makes chips for local distribution using the Wachusett name. Two truck manufacturing firms, the Wachusett Truck Company and the New England Truck Company, operated in Fitchburg during the early twentieth century. Simonds International, Saw manufacturer founded in Fitchburg in 1832 and still operating on Intervale Road. The Iver Johnson Arms and Cycle Works made motorcycles for a short time, in addition to their primary products, firearms and bicycles. Assumption Life, a large financial services company, was founded in Fitchburg in 1903 before moving to Moncton, New Brunswick. Long time businesses that continued to grace Main Street are Shack's Clothing and Duvarney Jewelers. New businesses that have opened on Main Street are Destare martini bar, Chaibo cafe a popular hang out and meeting place. When completed in June 2014 Great Wolf Lodge New England will have spent over 70 million dollars in renovations to former Holiday Inn/Coco Key Water Resort There will be over 400 new permanent jobs created from this project. The Fitchburg Central Steam Plant (locally known by its nickname: the PLT) was built in 1928 to provide steam and electricity to the many local paper mills. As the paper mills were abandoned or improved the Central Steam Plant fell into disuse and was abandoned. In 2008, the EPA designated the Central Steam Plant a brownfield site due to contamination of the site soil and groundwater with metals and inorganic contaminants. The EPA provided the City of Fitchburg $50,500 in grant money to help clean up hazardous substances on the site. Cleanup of the Central Steam Plant started in 2010 and is ongoing as of July 2011. Unfortunately as of December 2015 the Fitchburg Central Steam Plant has been razed. The last structure to fall being the massive smokestack. West Fitchburg Steamline Trail Park, a unique industrial heritage resource. Flat Rock Wild Life Sanctuary, a 326-acre wild life sanctuary that is part a network of Mass Aududon land, with 6 miles of trails. It is located within minutes from downtown Fitchburg, the hustling sounds of the city fade into a chorus of songbirds, rustling leaves, and zipping dragonflies. This wooded area provides habitat for species needing relatively large territories such as fisher, coyote, and red fox. Bobcat and black bear occasionally travel through these woods over rocky ledges and through hemlock groves. The West Fitchburg Steam Line Trail is a bike and walking path located in Fitchburg on Route 2A. It is 0.6 miles long and runs along the Nashua River and Flag Brook in the Waites Corner neighborhood. The path is gravel and is relatively easy terrain. The trail is the first contracted part of a planned project to build a mixed use bike and walking trail through Fitchburg. This trail will eventually connect with trails in the neighboring towns of Leominster and Westminster. Additional parts of the proposed trail are in the Riverfront and Gateway Parks. The Fitchburg Steam Line Trail is located near the junction of Route 31 (Princeton Rd) and Route 2A (Westminster St) at 465 Westminster Street. The trail parking lot is marked with signs, and is on the south side of 2A approximately ¼ mile East of Route 31. The trail starts to the left of the Fitchburg Central Steam Plant. In the fictional Harry Potter universe, Fitchburg is the hometown of the professional Quidditch team the Fitchburg Finches. The McConnell Story, starring Alan Ladd has its opening in Fitchburg, and many scenes of June Allyson's character's family are in Fitchburg, as the movie progresses. The opening scene in the popular 1961 movie, By Love Possessed, starring Lana Turner, Ephram Zimbalist Jr., Jason Robards, and George Hamilton, features Fitchburg's Court House and Monument Park. The band Nirvana played a concert at the Wallace Civic Center in Fitchburg on November 11, 1993. Before the concert, frontman Kurt Cobain bought a guitar at Salvatore Bros Great Music Box at 480 Main Street (now closed) which he famously played on the band's recording of MTV Unplugged In New York on November 18, 1993. In the Fringe episode "The Human Kind", Olivia goes to Fitchburg to retrieve an electromagnet. In 2012, Dark Horse Comics began releasing an eight-issue limited comic book series entitled Falling Skies: The Battle of Fitchburg, with Paul Tobin writing and Juan Ferreyra as artist. The story takes place chronologically between seasons one and two of the Falling Skies television show, and details a costly engagement occurring between the skitters and the 2nd Massachusetts Militia Regiment when the aliens surround the human forces at Fitchburg, Massachusetts. 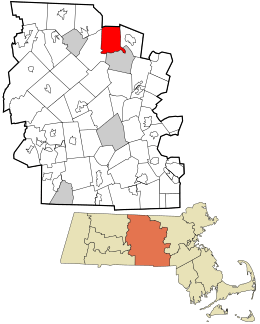 Fitchburg, Massachusetts Facts for Kids. Kiddle Encyclopedia.